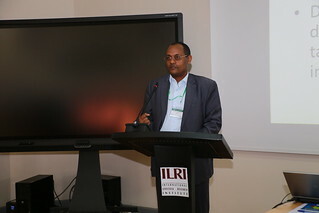 In his opening remarks, Fantahun Mengistu, Director General of the Ethiopian Institute of Agricultural Research (EIAR) pointed out that agriculture in Ethiopia is an important economic sector. He said that organic fertilizers have a high potential impact on agricultural productivity. However they have not been widely adopted and only two fertilizers, nitrogen and phosphorous, have been widely used. Moreover, while different parts of the country have different needs, fertilizer recommendations have been the same everywhere. In recent years, the Ministry of Agriculture (MOA) and the Agricultural Transformation Agency (ATA) are giving greater attention to fertilizers. Fertilizer factories have been established, soil maps have been produced and joint studies have been conducted. 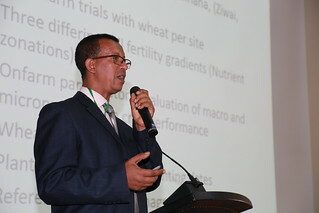 Tilahun Amede from ICRISAT presented the result of research carried out at four Africa RISING sites (Lemo, Sinana, Basona Worena and Endamehoni) under the title “Bridging yield gaps through crop-response based nutrient amendment”. The research found out that different types of soils have different reaction to the different fertilizers applied. In some cases the response is very satisfactory and in other cases not. After the presentation and discussion, participants agreed to create a country-wide collective engagement to further discuss and identify research gaps and develop practical decision support tools (DST) on three themes: (i) country-wide landscaping available information on fertilizer crop responses, and associated major actors in the field, (ii) identifying knowledge and data gaps and research questions; and (iii) suggesting a strategy and approaches to synthesize, fine-tune, and develop decision support systems at scale. Participants also agreed to establish a national task force to lead and facilitate linkages among stakeholders and enhance the innovation process in appropriate fertilizer application in the country. The task force will report to the EIAR director general; initial steps will be led by Tesfaye Shimber from the Land and Water Research Directorate and Tilahun Amede from the International Crops Research Institute for Semi-Arid Tropics (ICRISAT).